I absolutely LOVE zucchini. I look forward to our summer garden when I have the ability to head out and pick a fresh zucchini from our backyard daily. However, I can only make so many batches of Chocolate Chip Zucchini Muffins, so I’ve been collecting zucchini recipes over the years. Today’s recipe is absolutely delicious. It’s savory and satisfies my french fry or chip craving AND they’re pretty good for you. Preheat your oven to 400 degrees. Spray a large cookie sheet with cooking spray. Slice your zucchini into thin rounds. You don’t want paper thin rounds, as they will burn, but super thick slices will yield a “soggier” bite. Spray your zucchini rounds with cooking spray or drizzle them with olive oil. Make sure both sides of each round are well coated. 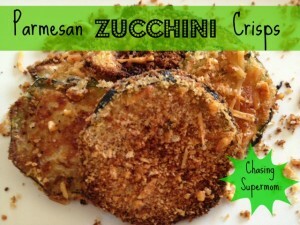 Dip each side of the zucchini rounds into the crumb mixture, pressing the crumbs and cheese down so that they stick. I made sure the tops of my crisps had a good amount of topping stuck to them. This part is a little bit time-consuming, but the crisps will be tastier with more topping. Bake for approximately 20 minutes, or until the zucchini is cooked through and the topping is crispy. If your topping isn’t quite crunchy enough, turn your broiler on for the last minute or two of cooking – just keep a watchful eye! Don’t expect these to be super crunchy like a potato chip. These are just a tasty way to enjoy zucchini, and provide a bit of texture. They would be awesome dipped in some marinara, but are also great on their own. This is a bad quality ipad photo, but I had to show you just how tasty these zucchini crisps are! This is my very finnicky two year old eating one! 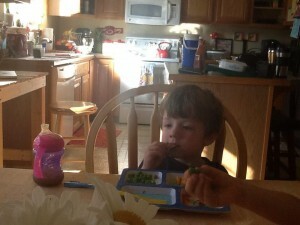 I was so excited that I got my son to eat a vegetable willingly! My whole family really enjoyed this side dish….so much in-fact that there were only a few left to take a photo of for the blog! 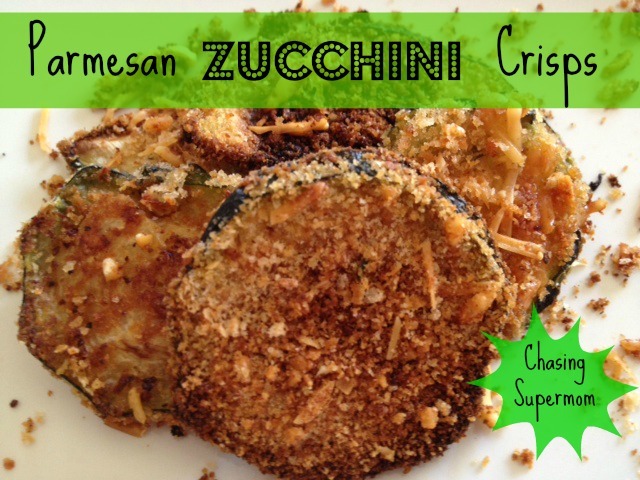 So much for the lovely picture of my parmesan zucchini crisps on a beautiful summer platter…Oh well, just more proof that this is a family-friendly dish that aligns with my Supermom recipe trifecta…It’s cheap. It’s easy. The kids will eat it!